EVANSTON, Ill., October 16, 2018	(Newswire.com) - Katalyst Technologies Inc., a best-in-class software, technology services and solutions provider, today announced that it had joined the NetSuite Alliance Partner Program. The collaboration with Oracle NetSuite enables Katalyst Technologies to leverage its more than 15 years of experience providing consulting services to promote, implement and customize NetSuite to its clients in multiple industries, including distribution and wholesale, manufacturing, retail, logistics and transportation. Katalyst Technologies chose NetSuite because of the company’s proven track record of providing cost-effective, end-to-end ERP cloud solutions to midmarket companies. This collaboration will enable Katalyst to deploy an affordable and low-risk packaged solution to the mid-level market segment. “Katalyst is delighted about its new collaboration with Oracle NetSuite. Our industry experience, combined with NetSuite Cloud ERP, will help organizations streamline the management of financials, inventory, reporting and warehouse optimization to grow their businesses successfully,” said Bade Dahunsi, SVP ERP, Katalyst Technologies. 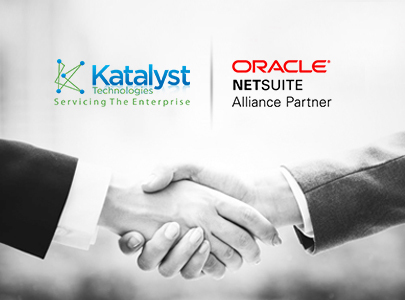 Katalyst is delighted about its new collaboration with Oracle NetSuite. Our industry experience, combined with NetSuite Cloud ERP, will help organizations streamline the management of financials, inventory, reporting and warehouse optimization to grow their businesses successfully. SVP ERP, Katalyst Technologies Inc.
"We are excited to welcome Katalyst Technologies into the Alliance Partner Program," said Craig West, vice president of alliances and channel, Oracle NetSuite. "Katalyst is well-positioned to serve mid-market customers with its ERP expertise and industry experience. This combination coupled with NetSuite's rich functionality and scalability will greatly benefit our future joint customers." The NetSuite Alliance Partner program provides business transformation consulting services as well as integration and implementation services that help customers get even more value from their NetSuite software. Alliance Partners are experts in their field and have a deep and unique understanding of NetSuite solutions. NetSuite provides Alliance Partners with a robust set of resources, certified training and tools, enabling them to develop expertise around specific business functions, product areas and industries so they can efficiently assist customers, differentiate their practices and grow their business. For more information, please visit http://www.netsuite.com/portal/partners/alliance-partner-program.shtml. For more than 20 years, Oracle NetSuite has helped organizations grow, scale and adapt to change. NetSuite provides a suite of cloud-based applications, which includes financials/Enterprise Resource Planning (ERP), HR, professional services automation and omnichannel commerce, used by more than 40,000 organizations and subsidiaries in 199 countries and territories.